Ordinary cables can’t handle the high bandwidth of HDTV without downgrading it or losing some of the depth and vividness. Monster Video 3 delivers every nuance and high-def detail without signal loss, so you can be assured that you’re getting all the HDTV performance you paid for. Get the most out of both digital and traditional high resolution video sources. Engineered to fit the latest technology, MVSV3 delivers the sharpest, brightest picture an most accurate S-Video signal. Monster HDMI (High Definition Multimedia Interface) 400 is a remarkable new high-bandwidth digital connection that offers superior digital video and multi-channel audio in a single cable, reducing the maze of home theater connections. Its simple, user-friendly connection is backwards-compatible with DVI, and it delivers a high-definition picture that’s five times the resolution of conventional TV for the highest quality, crispest image quality available. The Highest Quality All-Digital Video Interface, Monster DVI400 is a pure digital high bandwidth video interface. What you see on your screen is exactly what was digitally transmitted. DVI400 is designed to support the high bandwidth demands from your set top box to the HDTV display. DVI400 supports up to 24-bit digital RGB data behind each pixel for the highest quality image. You’ll enjoy a razor sharp picture with incredible detail and vibrant, natural colors, even if you’re forced to use long cable runs. HDMI and DVI’s superior digital high-definition video signals give viewers the best picture of any available format. And since HDMI is backwards-compatible with DVI, you can connect HDMI-capable components and displays to equipment with DVI connections, without having to worry about compatibility. Monster can help you connect all of your HDMI and DVI devices like DVD players, HDTVs, set-top boxes and AV receivers with one cable that helps utilize and optimize both formats: Monster’s HDMI 400. Monster Video 3's (MV3) reputation for delivering the clearest, sharpest picture and the brightest, most accurate colors is well founded. MV3 was the first video cable ever to receive certification by the prestigious Imaging Science Foundation -- the home theatre industry's recognized authority on video reproduction. With an extremely linear bandwidth to 550MHz and 75-Ohm impedance, MV3 offers consistently outstanding picture definition for composite video, component video and cable TV. Traditionally, connections have proven to be the weak link in fiber optic design. 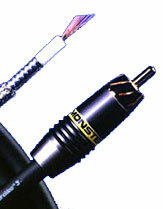 Monster has overcome this obstacle by precision -- polishing their connections for a perfect termination of the fiber. The result is high signal transmission, low internal reflection and minimization of jitter and time distortion for cleaner, more natural sound. Get the Best Possible Digital Audio Performance. DataLink 100's advanced engineering delivers all the data when your components need it for the best possible sound from all your digital coaxial sources. High purity copper strandings in the all-critical center conductor ensure faster transients for the greatest clarity and detail. Loaded with the finest technologies, DataLink 100 delivers all the digital signal for smooth, natural reproduction of music, dialogue and effects.